Remember the excitement of Easter morning? I do. My seven siblings and I would squeal with unrestrained delight at the sight of our Easter baskets stuffed with colorful faux grass and overflowing with foil-wrapped chocolate goodies, gaily decorated eggs, shiny jelly beans and sugary spice gum drops. Tucked somewhere amidst all these would be an extra-special treat, and we eagerly searched for it. Would it be an edible sugar egg? Or might it be a cream-filled chocolate egg? Perhaps a small toy? After a thorough examination of our baskets, and the eating of one and only one piece of candy, my father called his giggling troops to order and reviewed the annual indoor Easter Egg Hunt rules: There would be no pushing, no shoving, no pinching, kicking or grabbing out of the hands of others. We all lined up as if for a 100-yard dash and on the count of 1-2-3, we were off and running (and pushing, shoving, pinching, etcetera)! There’s a certain thrill about searching behind, under, and over every couch, chair, table and bed and finding a colorful gem of an egg. Some eggs were of the hard-boiled variety, while others were paper mache, wood, or plastic and contained candy, a small toy or a coin. When all eggs were accounted for (though I remember when after a few days the last lost rotten egg gave away its hiding place), Mother had breakfast prepared, which in addition to Easter eggs included a feast of fresh fruits, nuts, Easter stollen, hot cross buns, and several varieties of traditional nut rolls. I hold these memories dear, and each year I enjoy reliving them vicariously, as I watch my two grandchildren. 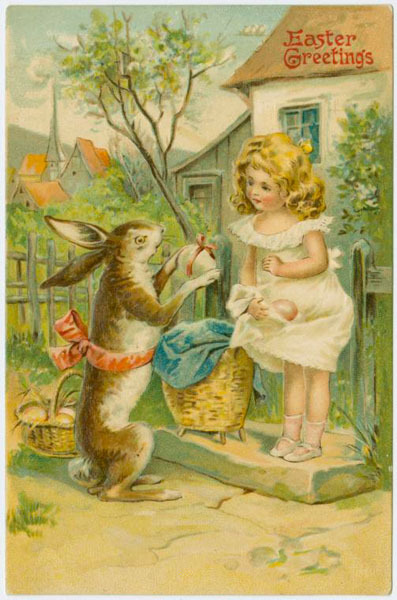 Though they say they are now too old for an Easter egg hunt, a small basket of old-fashioned goodies is still not only welcome, it’s eagerly anticipated and appreciated. 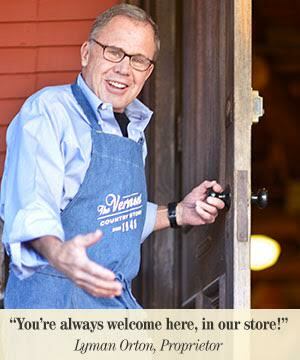 Here are some of the old-fashioned treats and gifts from The Vermont Country Store I’ll be sharing with my loved ones this year. A two-pound bag of the original jelly beans in classic flavors: cinnamon, clove, wintergreen, peppermint, and spearmint. Nice and chewy, they taste like spice gumdrops. I’ll open the bag, put plenty in each basket and fill a few candy dishes. Kids of all ages love the natural fruit flavors: lemon, grape, cherry, strawberry, orange, and lime—thanks to the real pectin. There are plenty in this two-pound bag to scatter amidst the spice beans in the baskets, but I offer pectin and spice jelly beans in separate candy dishes, in case a guest prefers one or the other. These are so much better than the ones you find in generic stores! 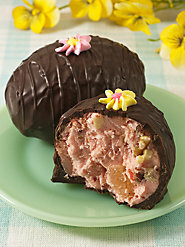 This traditional chocolate Easter egg is packed with pineapple, cherries, and walnuts, and topped with a pastel sugar flower. My grandson loves dark chocolate, but it’s also available in milk chocolate. Weighing in at one-half pound, it’s the perfect size to snack on over a few days. If you grew up in the Midwest, you probably have tasted these melt-in-your mouth gems. If you haven’t, you should! 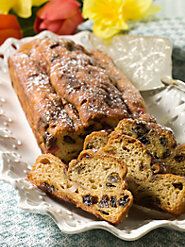 Fluffy whipped crème centers (choose raspberry or vanilla) are covered with rich Swiss chocolate (choose milk or dark). I have a box of milk chocolate vanilla and one dark chocolate raspberry and will give half of each for both children. My grandson has always had a penchant for sour candies, so every year I indulge him with a generous amount of a variety he’s never had before. Now well into his teens, he’s become somewhat of a connoisseur. These chick-, egg- and bunny-shaped pectin sour candies are new additions to The Vermont Country Store’s Easter candy line-up, so I’m looking forward to hearing my sour-candy expert’s opinion. 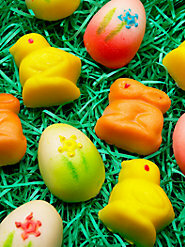 Every Easter, my German grandparents (who lived in Germany) would send a box of the most delightful marzipan, shaped like chicks, carrots, eggs, and bunnies. They were so precious, we children would sometimes squabble when divvying them up. Thus, no Easter celebration is complete without a bit of marzipan. An esteemed marzipan-maker in the United States makes these almond-flavored delicacies the time-honored way, in copper kettles. The box of 18 include 12 eggs, 3 bunnies and 3 chicks, each one unique in some small way. Did you ever have a Hurdy Gurdy? These miniature music boxes are as delightful as their larger cousins, perhaps even more so because in addition to the quality of the sound and their Victorian-inspired decorations, they can carried in a pocket or purse for anytime, anywhere entertainment. Turn the crank and listen to these beloved classics: Swan Lake (for mother), Blue Danube (for grandson), Moonlight Sonata (for myself), and Fur Elise (for granddaughter). These 3-dimensional, entirely edible sweet treats have been a European tradition since 1900. I remember my older brother offering me his half-pound solid chocolate rabbit for my sugar egg with Peter Rabbit inside. No, thank you! I nibbled on that egg for four months; his chocolate was history in two days. But the real appeal for me as a child, and now as a grandmother, is the egg’s turn-of-the-century charm. They nostalgically speak to my heart of candy craftsman making treasured confections to inspire awe and delight in a child’s imagination. And though I no longer eat them, they are delightful to behold on my living room coffee tables. 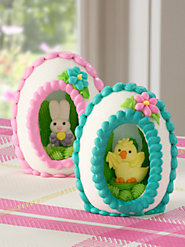 Yes, as long as I live, I will carry on the sugar egg tradition, and I believe my children and grandchildren will, too. Easter is not Easter without a chocolate foiled bunny. But don’t settle for those run-of-the mill chocolate bunnies you find in chain stores. These gourmet chocolate rabbits, made from original candy molds by a family-owned company here in the USA, are worthy of the love and care you put into creating your Easter baskets. Simply peeling the foil off these bunnies takes me back to my childhood, and the rich, creamy, milk chocolate is precisely what chocolate used to be. Easter has long been my daughter’s favorite holiday, so it was no surprise to me when she started a collection of rabbit figurines as a young girl. Now, as she nears her fourth decade, her “hoppy” home is (over)populated with an abundance of bunnies. 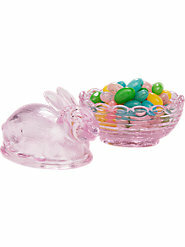 I know she will love this little bunny dish, crafted by Mosser, a USA glass artisan. At about 4” long and high, it’s not too big and not too small, the perfect size to serve as a candy dish or as part of a centerpiece. Available in pink or opal, I chose pink and will fill it with her favorite pectin jelly beans before wrapping. I hope my gift list has inspired you to have a good old-fashioned Easter this year. Keep in mind, nearly all of these Easter items are seasonal. Once the supplies are sold out, they won’t be available again until next year. So if you are going to play Easter bunny, you better get hopping and start shopping! And please be sure to share your special Easter memories with us.